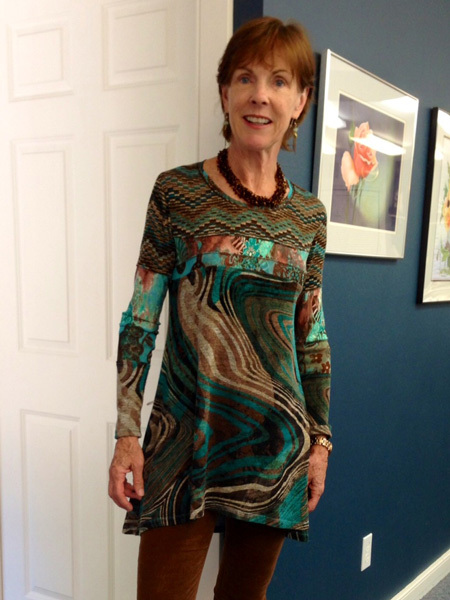 Cathy found this amazing knit at Stonemountain and Daughter Fabrics. 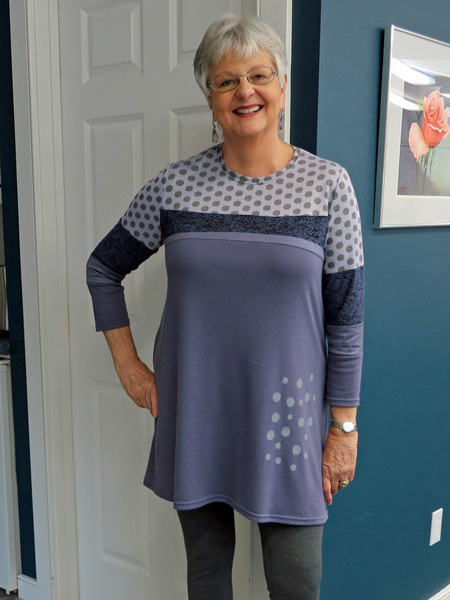 The pattern is Marcy Tilton's Vogue 9057. 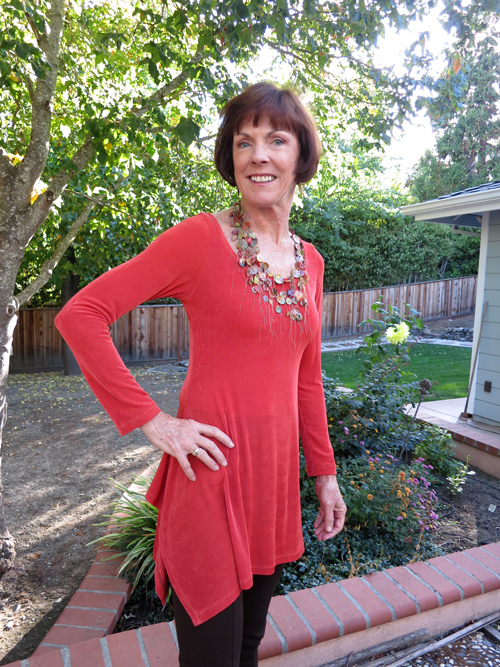 Barbara made another cute Katherine Tilton's V8817 top. 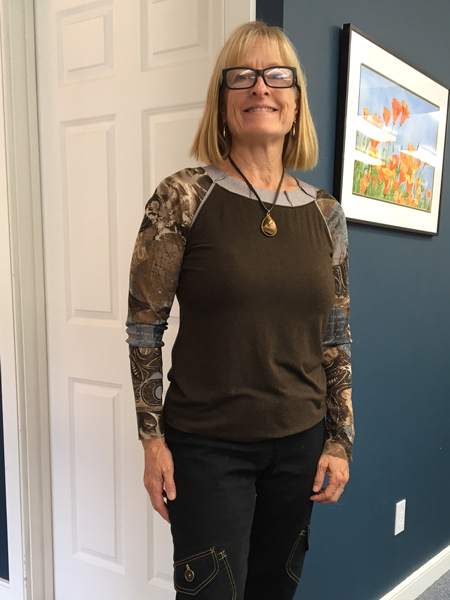 Robin made this charming top using stretch lace from JoAnn's. 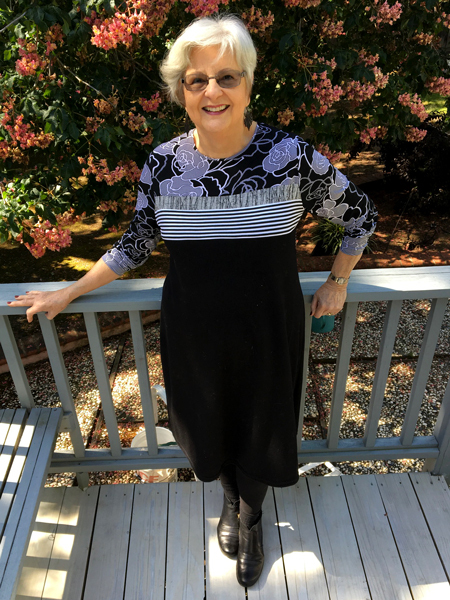 Barbara made this dress using the Libby Dress pattern from StyleArc. She used twin needle stitching on the yoke. Jackie trimmed her tee with black knit. Vicki silk screened her top. The pattern is a result of many fittings with Jane, and now has been trasferred to tag board as her master pattern. Susie used Vogue V9268 designed by Kathryn Brenne. The fabric came from JoAnns. Jane feels this is a good pattern and several people wish to make it. 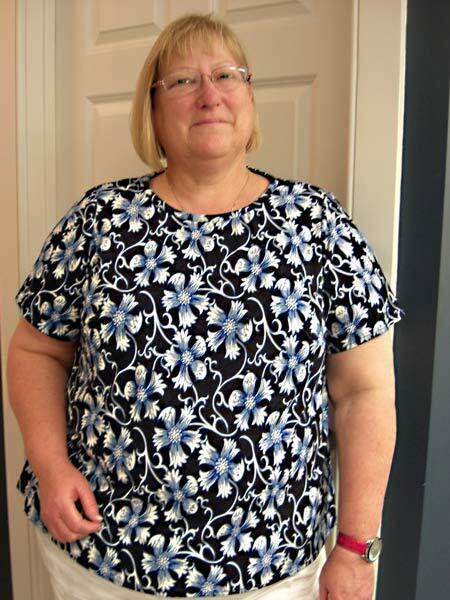 Cathy T selected Maggy London's Butterick B4789 pattern for her interesting top. 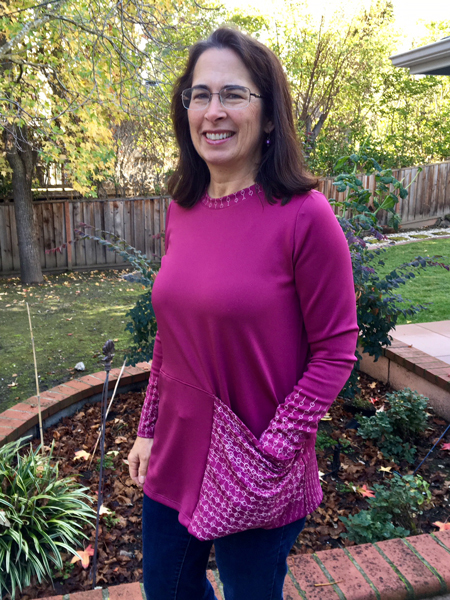 Robin made this knit top during Jane's Fall Sewing Retreat. 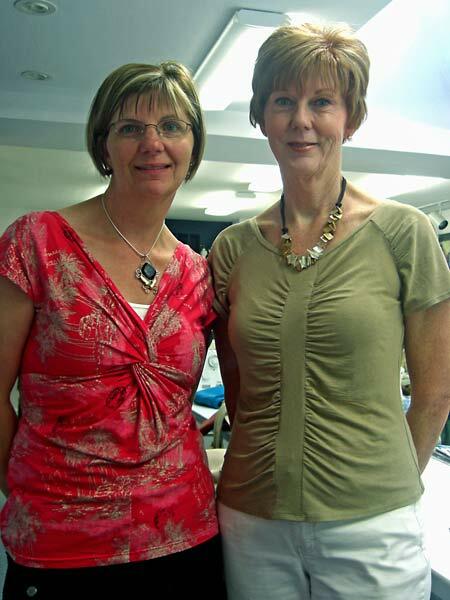 Sylvia always enjoys Jane's Auburn Sewing Retreats. 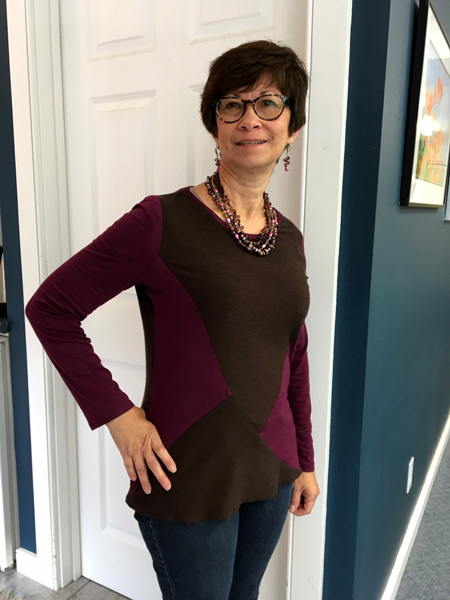 Cathy is wearing a top made with Katherine Tilton's Vogue 8817 pattern. 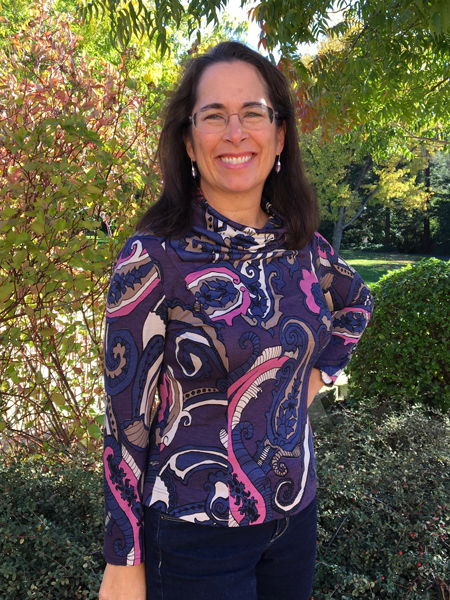 Vicki purchased her fabric from Marcy Tilton. Carol made a fabulous outfit. 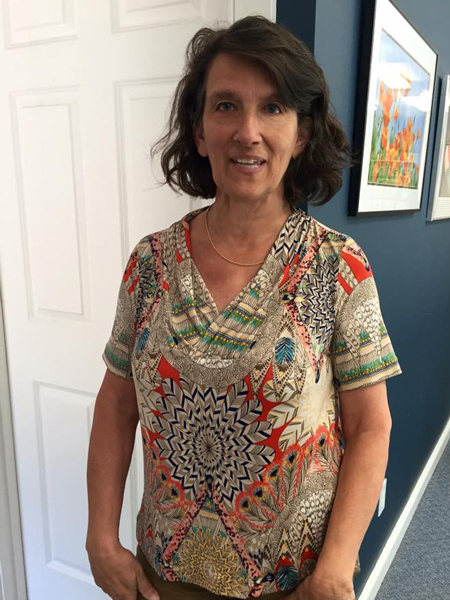 Vicki finished her beautiful silk knit top. 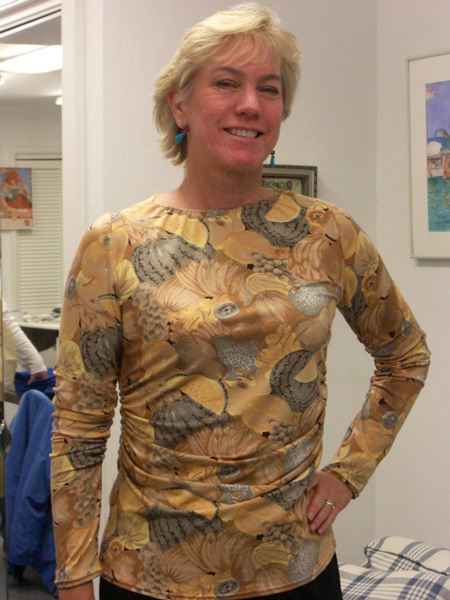 The fabric came as a gift from a friend, and the pattern is Marcy Tilton's Vogue 8497. 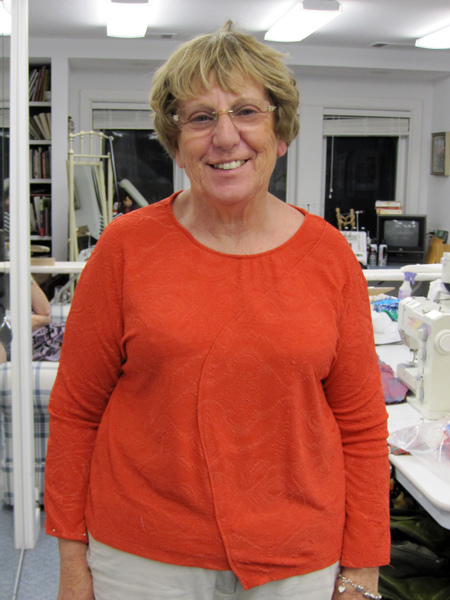 Vicki took great care to "fussy" cut the fabric for optimal fabric design placement. 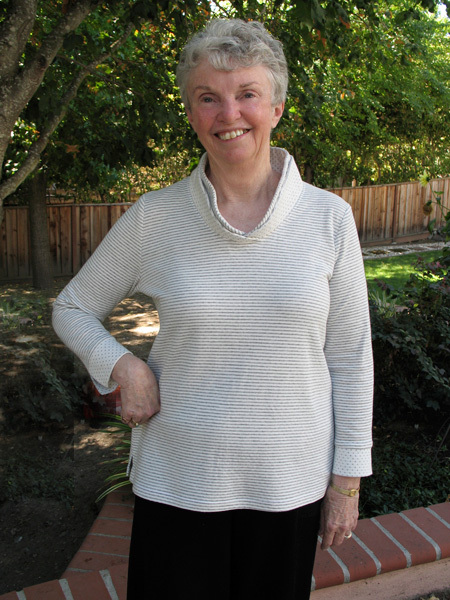 Pat looks great in her new knit top. She used Vogue 8856 for the pattern. 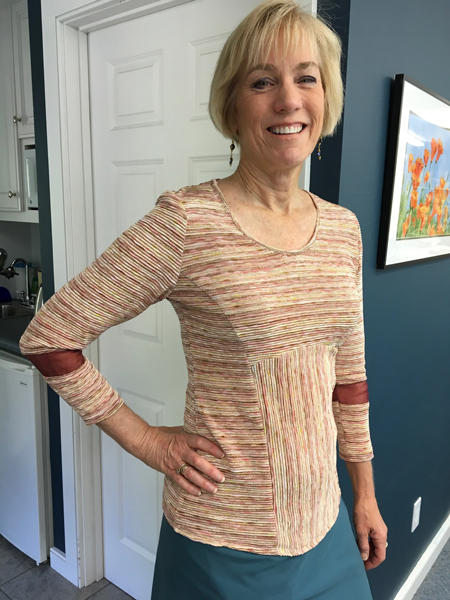 Jane made a great knit top with Katherine Tilton's Vogue 8817 pattern. 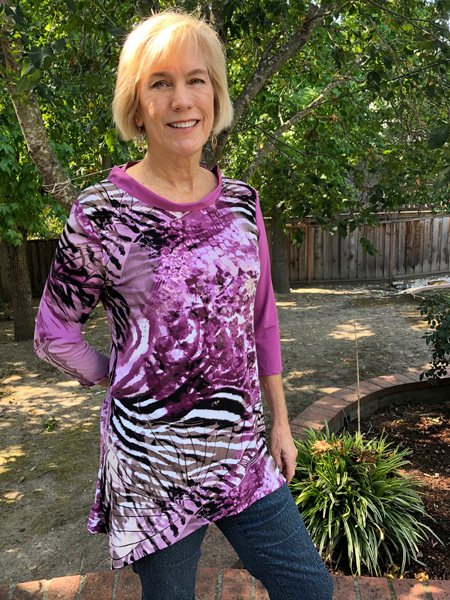 Vicki made her tee shirt using Katherine Tilton's Vogue 8793 pattern and fabrics from her stash. 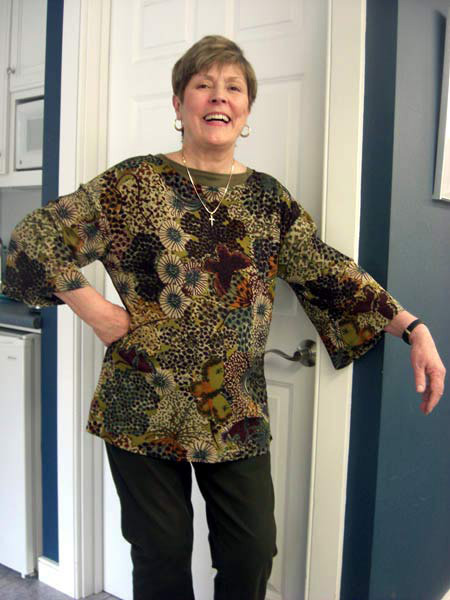 This is the pattern that is used for The Ultimate Tee Shirt class on Craftsy.com by Marcy Tilton and Katherine Tilton. 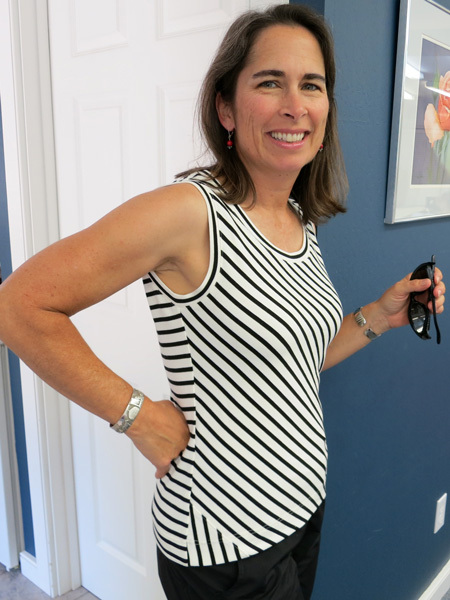 Liz selected Katherine Tilton's Vogue 8793 pattern for her stripe top. 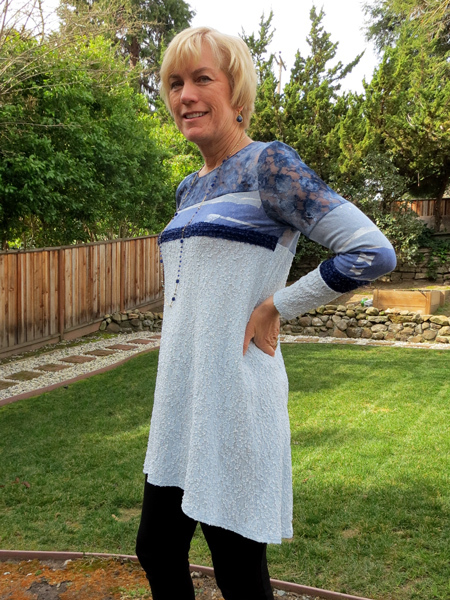 Jasna created this stunning tunic on her 2015 Sewing Retreat with Jane. She copied the pattern from ready to wear. 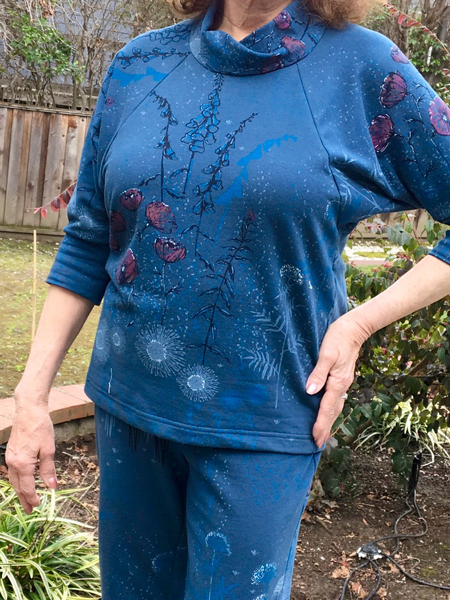 After receiving my wonderful Babylock serger from my students, I decided the next garments I created would be made entirely on the serger. 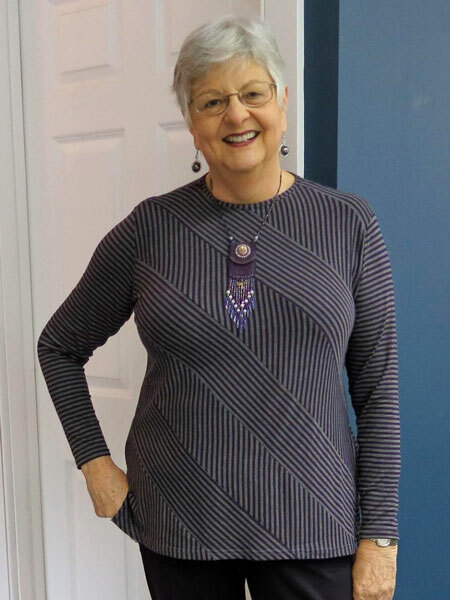 The striped rayon knit for the tee shirt and the rayon blend ponte for the slacks were both purchased at Stone Mountain and Daughter Fabrics in Berkeley. 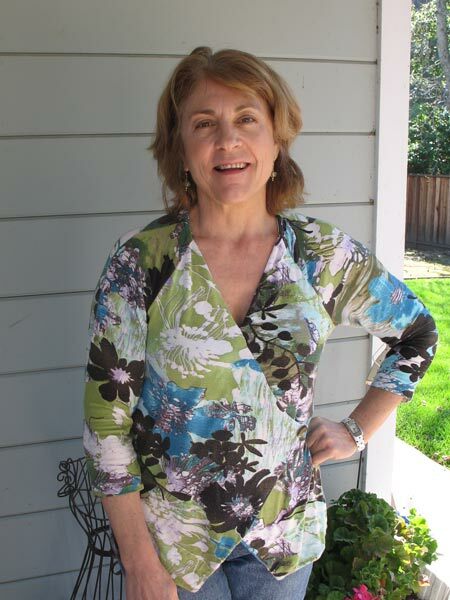 Maria made this Marcy Tilton Vogue 8636 top several times. Here she stenciled on the arms and brought it over to the front for a more cohesive look. 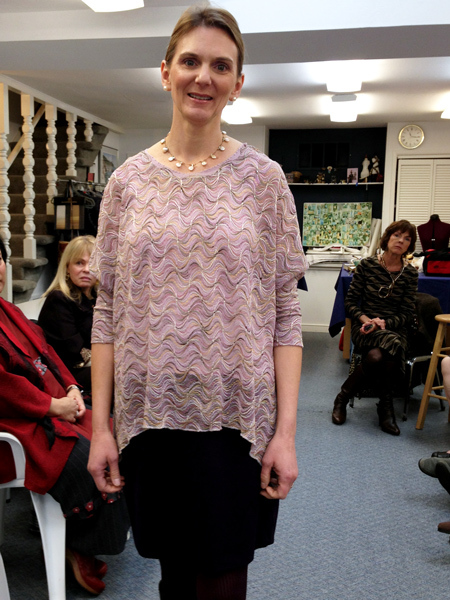 Here is another of Maria's tops made with V8636. 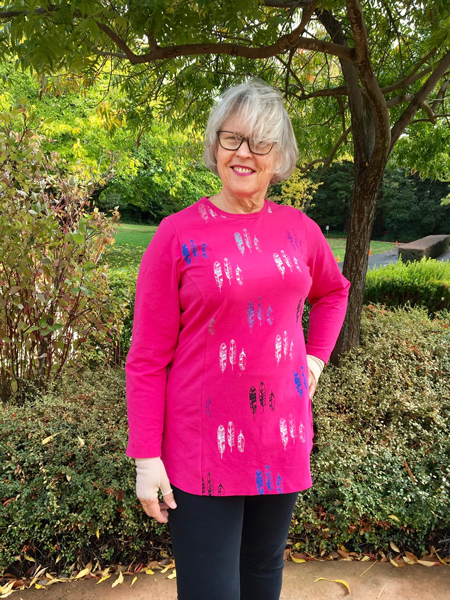 Lark added applique to the yoke Katherine Tilton's Vogue 8817 pattern. 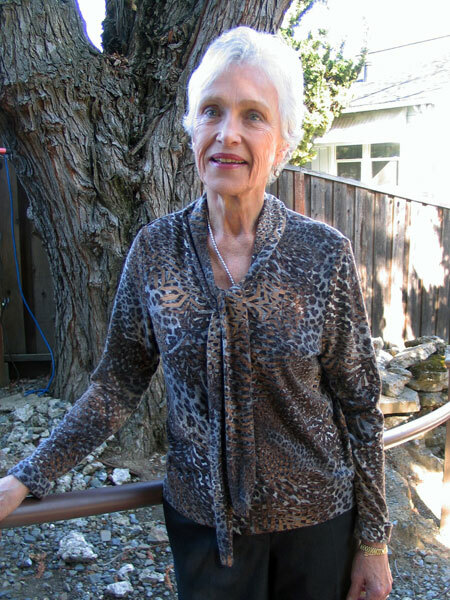 Jeannie made a scoop neckline on her Marcy Tilton Vogue 8582 top. 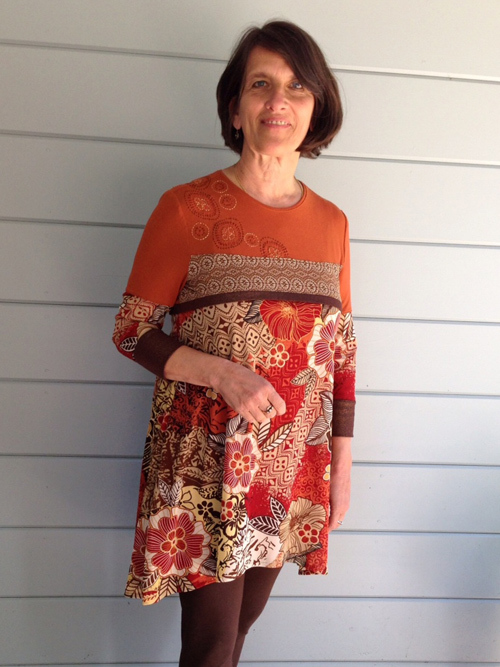 Here's Vicki who finished her pretty knit dress. She worked so well on it. The pattern is one Jane made from one of her knit ready to wear dresses. 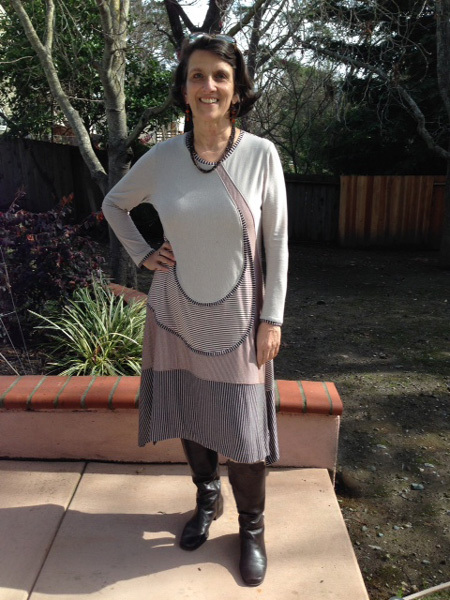 Vicki used a variety of knits and stripes, and she does look wonderful!. 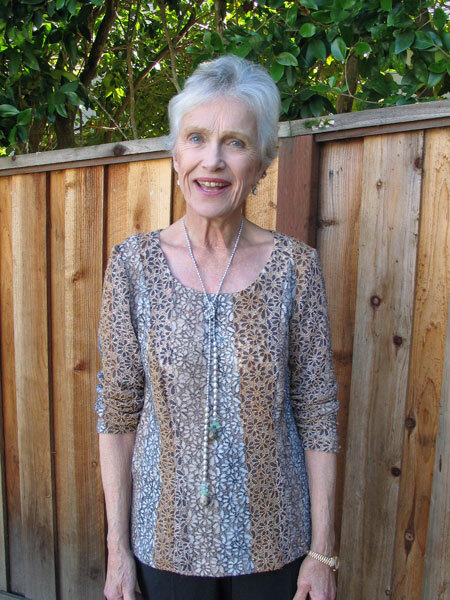 Jeannie selcted Katherine Tilton's Vogue V8817 pattern. 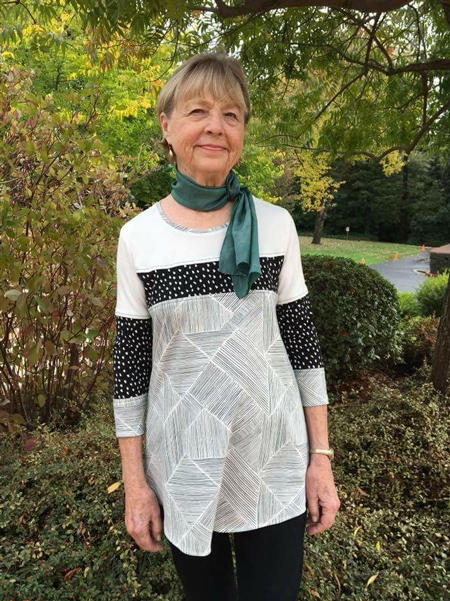 Cathy selected Katherine Tilton's Vogue V8817 pattern. 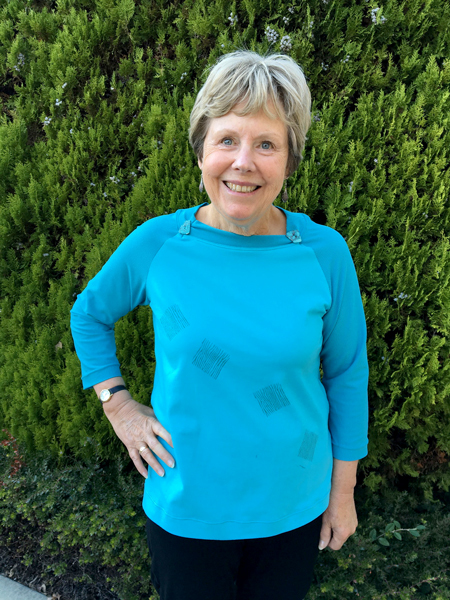 Jane selected Katherine Tilton's Vogue V8817 pattern for her top. She screened on the dots. 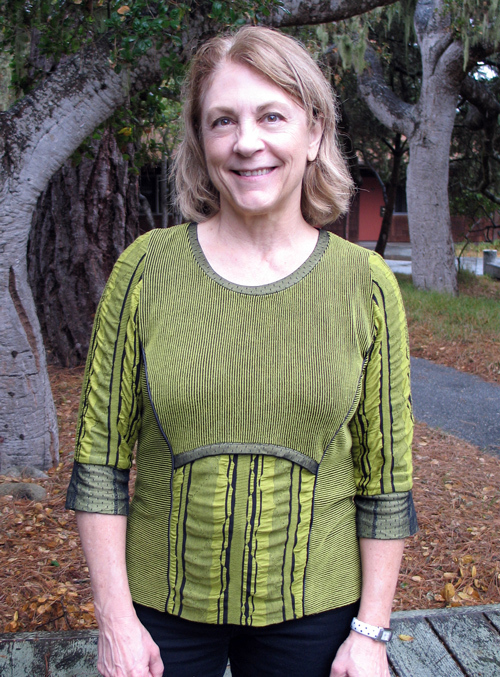 Vicki used Katherine Tilton's Vogue V8817 pattern for her top, and hand embroidered the circles on the top portion. 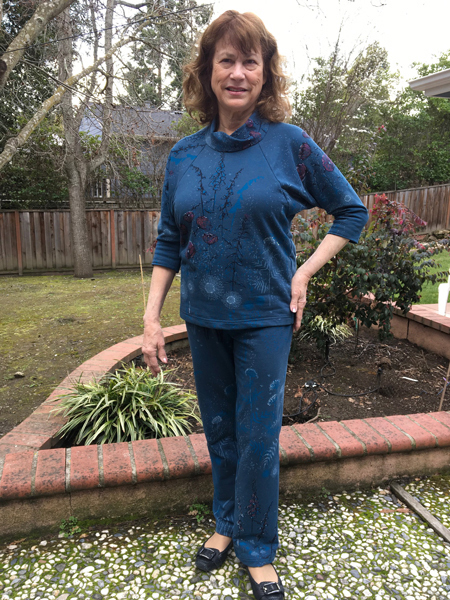 Jeannie again used Katherine Tilton's Vogue V8817 pattern. 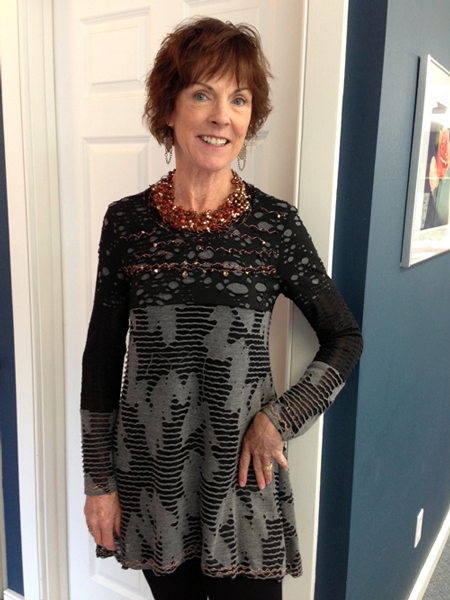 Jeannie looks great in Katherine Tilton's Vogue V8817 pattern. 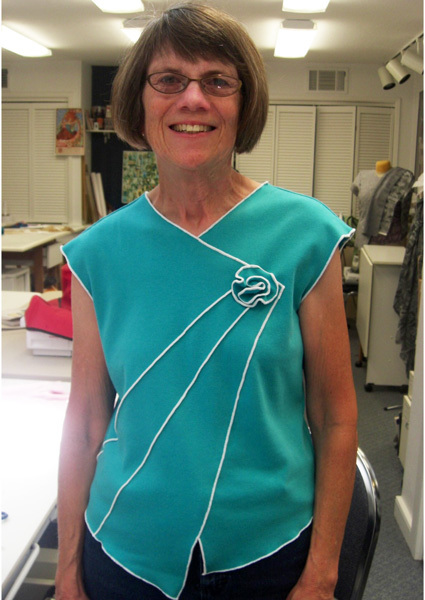 Ellen added a personal touch to Katherine Tilton's Vogue V8817 pattern by appliqueing the circles on the skirt. Lark also selected Katherine Tilton's Vogue V8817 pattern. 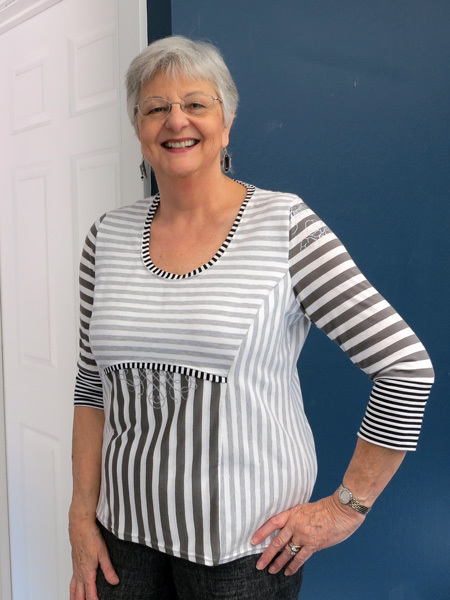 Jane purchased a selection of stripe fabric from Marcy Tilton to make this fabulous top using Katherine Tilton's Vogue 8V8817 pattern. 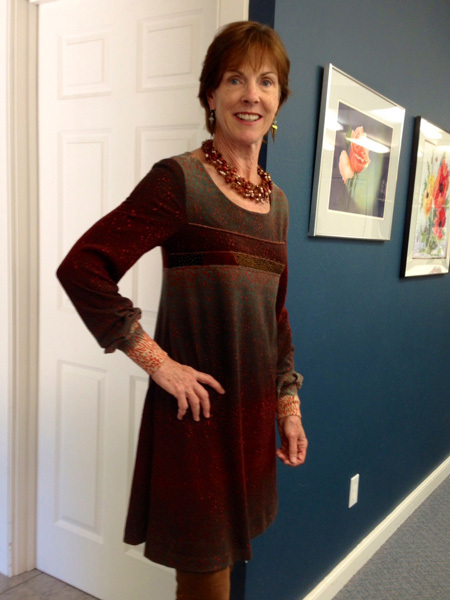 Lark made both version of Katherine Tilton's Vogue V8817 pattern. 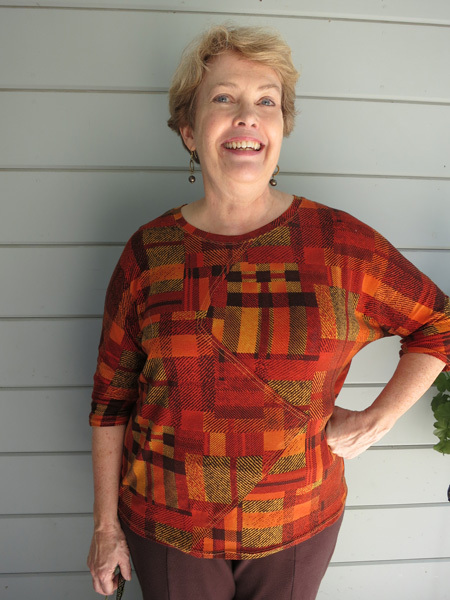 Susie was happy with Katherine Tilton's Vogue V8817 pattern. 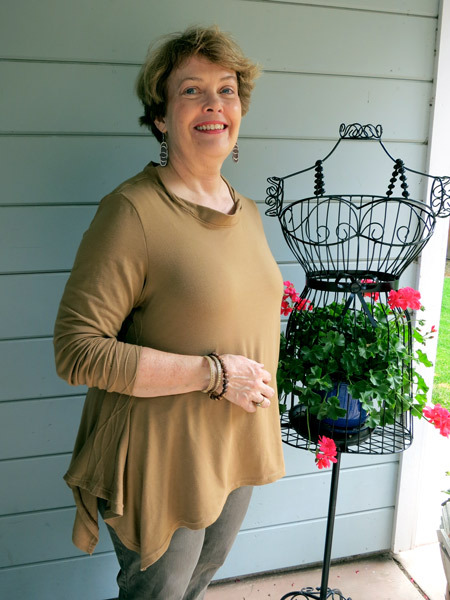 Kathleen selected Marcy Tilton Vogue 8497 pattern for her top. .
Betty also selected Marcy Tilton Vogue 8497 pattern for her orange top. 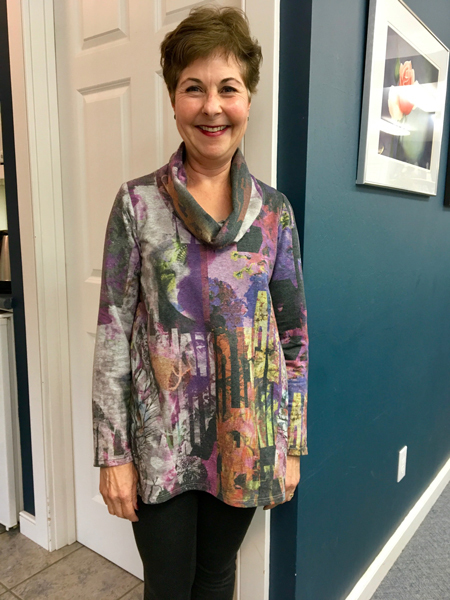 Zelda found the perfect scarf to go with the Marcy Tilton Vogue 8582 top she made. 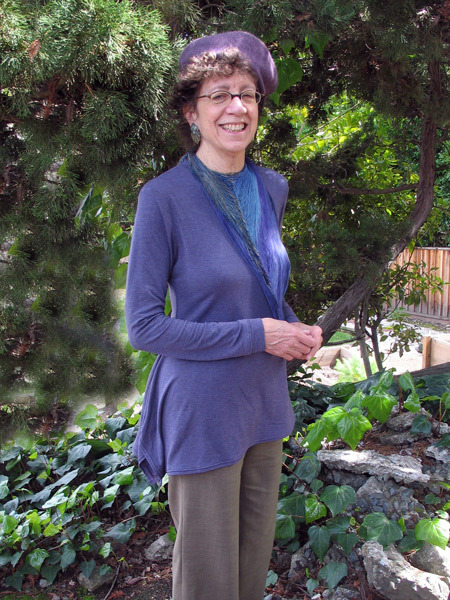 Kathleen slected Marcy Tilton Vogue 8582 pattern for her tunic. 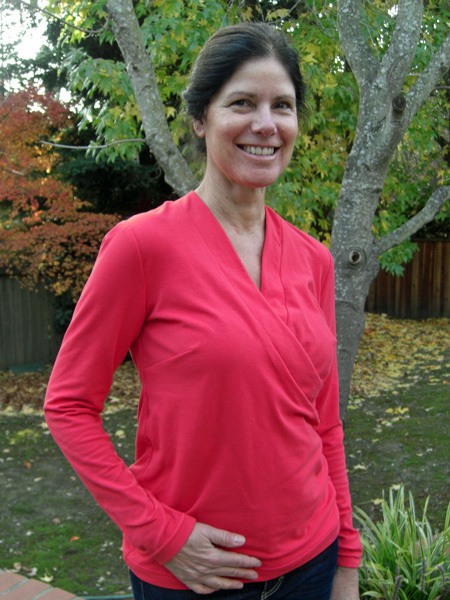 Kathleen chose coordinating red knits for her top made with Katherine Tilton's Vogue V8817 pattern. 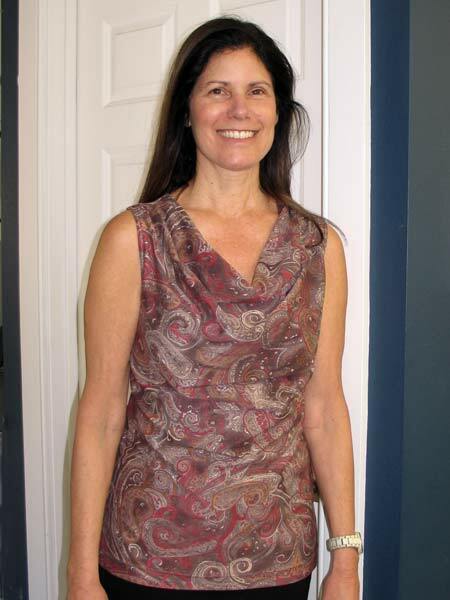 Janice selected Hot Patterns HP 1113 for this top with serged edges. 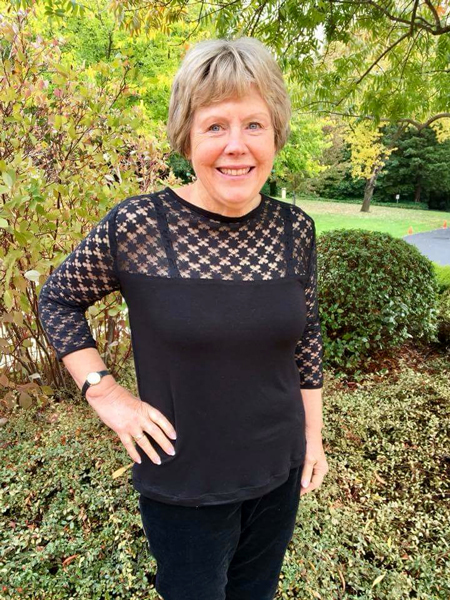 Katherine selected a lacy fabric for her top. JoAnn selected a cotton print fabric. Carrie embroidered sissors on her top. 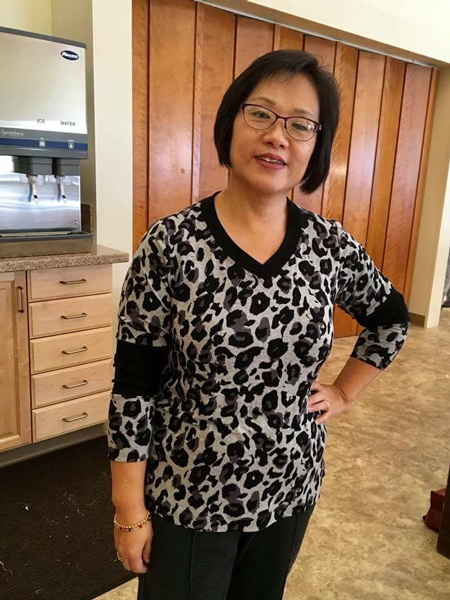 Helen looks great in her animal print top. 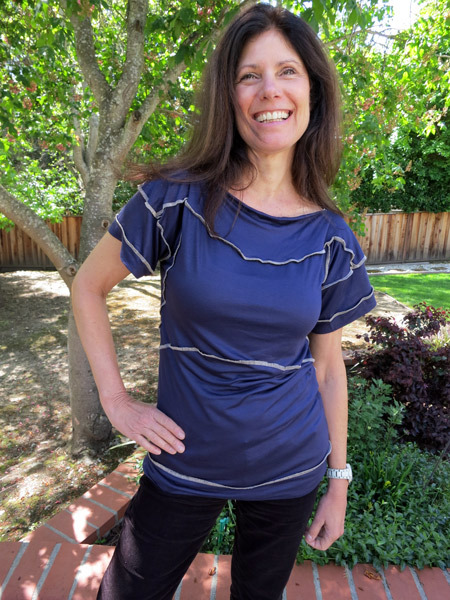 Liz selected Christine Jonson V Neck Tee pattern 714 to use for this stipe top. 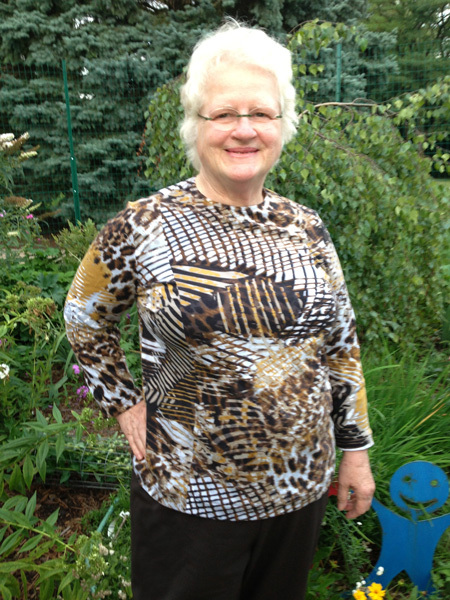 Cathy used Christine Jonson's Shirred Top pattern 426. 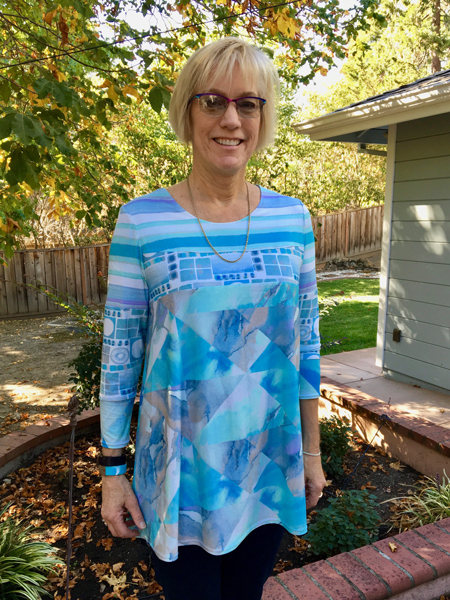 Janice used a Sandra Betzina pattern. 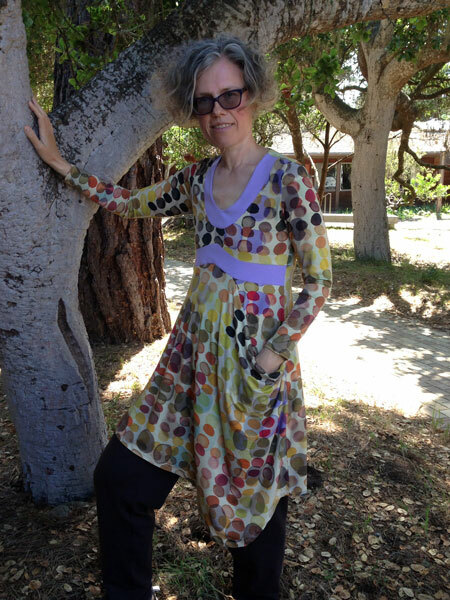 Lark selected a Sandra Betzina pattern. 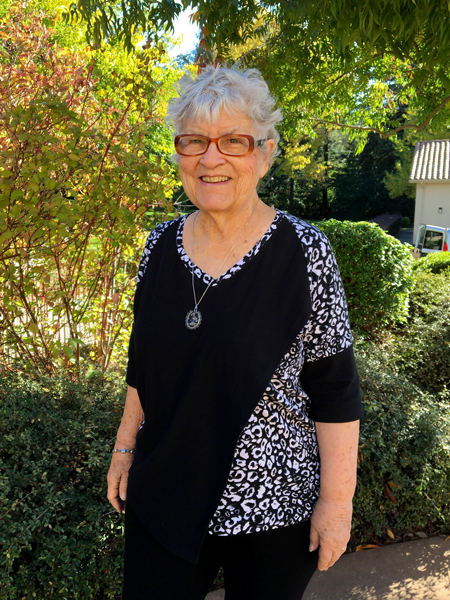 Jackie had limited fabric for her top, but she succeeded! Maria used a eggplant colored fabric to trim her top. 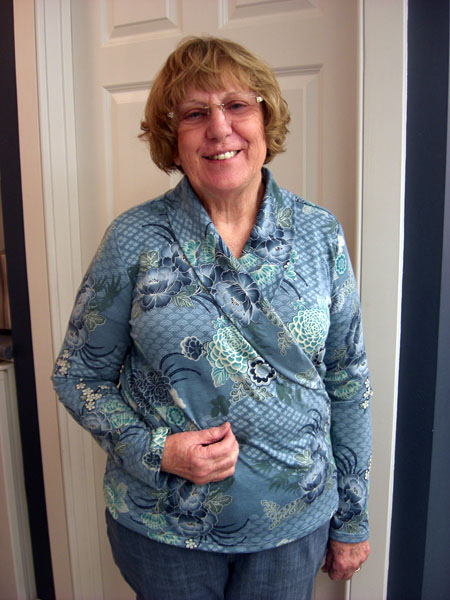 Janice created a pattern for this top by copying a ready to wear garment. Ruth finds the nicest prints. 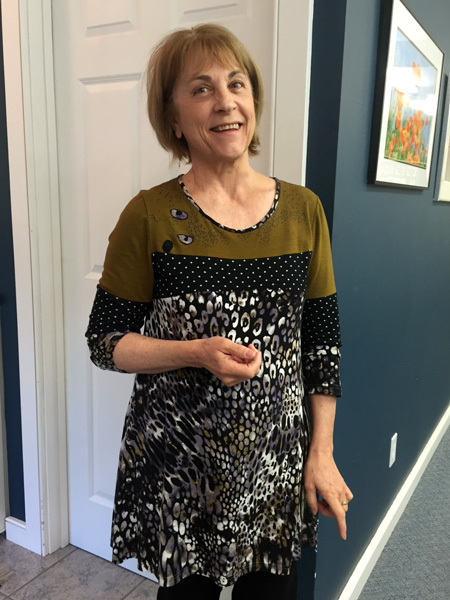 Sally added a little detail at the hem by changing the direction of the stripes. 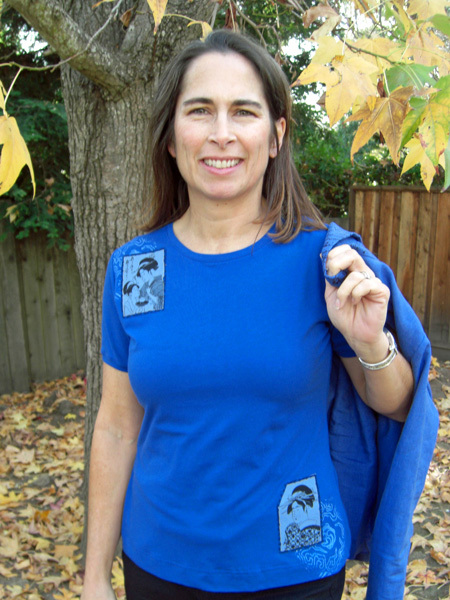 Sally uses stencils to embellish her garments. 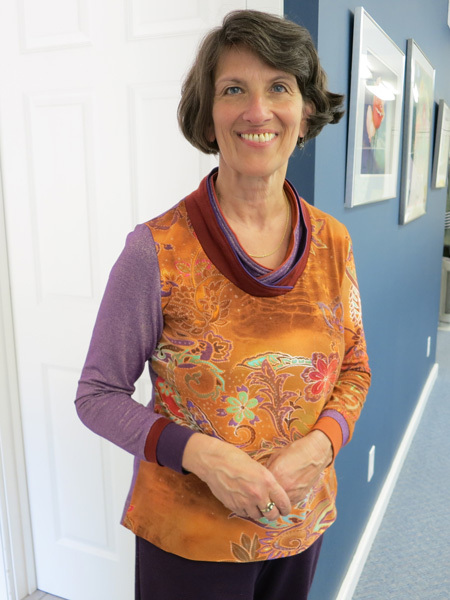 Roberta copied a ready to wear garment and made this fabulous top with serged edges. 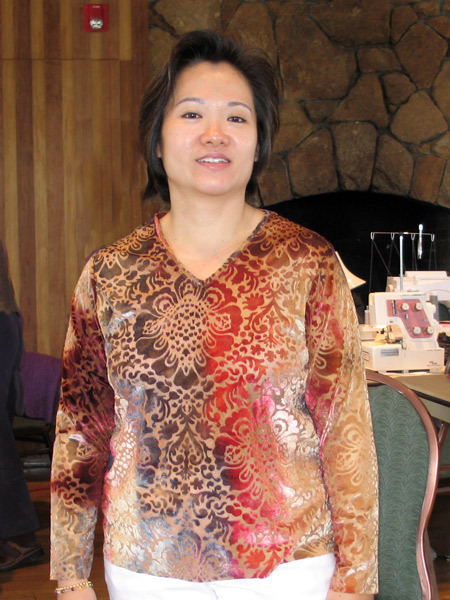 Helen used a stylized flower print fabric for her top. Barbara and Sharon model their tee shirts. Betty found this fabric at Piedmont Fabric's on an outing with Jane and Sharon. Sharon is wearing a rayon/lycra tee shirt. 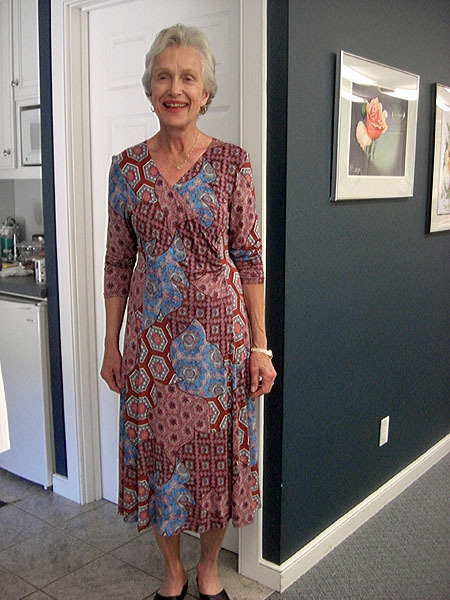 Jane made the princess line pattern by draping fabric on her while she attended the Spring 2013 Sewing Retreat and Vacation on Monterey Bay. 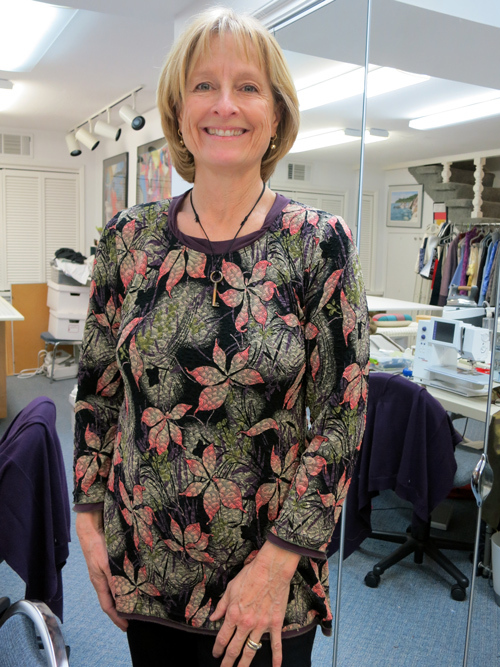 Barbara used twin needles to decorated the sleeves and front of her garment. 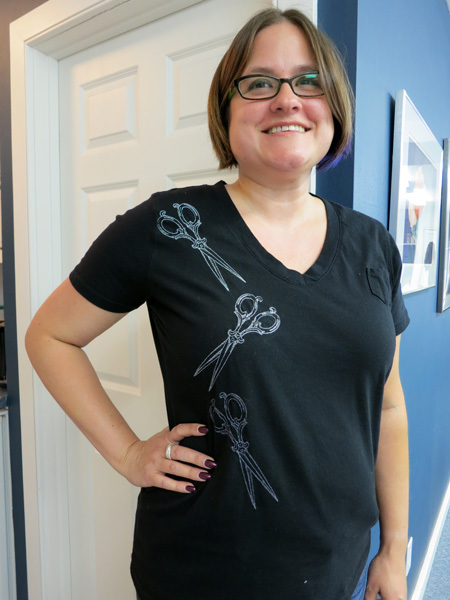 Santina used stencils from Marcy Tilton for her top. 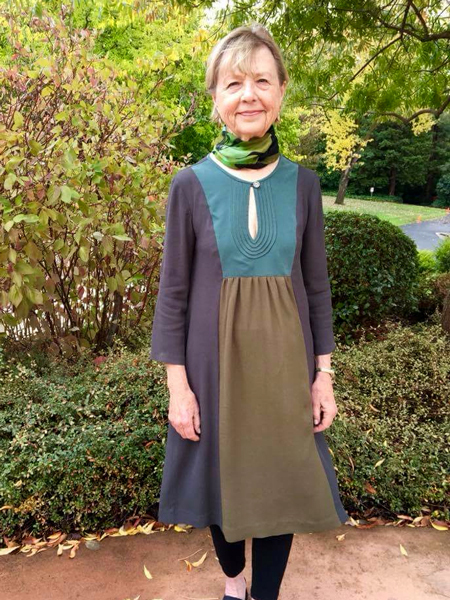 Helen looks so elegant in her knit dress, The fabric is very interesting and was available from Emmaonesock.com.